British curators want to say something new new about Picasso, about whom so much has been said already, so they don’t put on general exhibitions of his work any more, only shows with an angle. Tate Liverpool put on Picasso: Peace and Freedom in 2010; Tate Modern put on Matisse/Picasso in 2002; the Royal Academy put on Picasso: Painter and Sculptor in Clay in 1998; and the Tate put on On Classic Ground: Picasso, Leger, De Chirico and the New Classicism in 1990. This exhibition at Tate Britain covers Picasso’s reception in Britain and his influence on British art. To some extent, it is an art historian’s exhibition, detailing past Picasso exhibitions, his dealers and journal articles about him. A similar exhibition, Picasso and American Art, was put by the Whitney Museum, New York, in 2006. A general exhibition of works from the Picasso Museum in Paris is currently touring the USA, Australia and Canada, but otherwise you will have to visit the permanent exhibitions of his work at the Musée National Picasso (Paris), the Museu Picasso (Barcelona) or the Museo Picasso (Malaga). Picasso’s reputation in Britain is so big now that it is surprising to discover that it was uncertain here until he was almost eighty. It was not established until 1960, when the Arts Council put on a retrospective of 270 works at the Tate Gallery, including his series Las Meninas, based on Velasquez. It attracted 500,000 visitors. It was the first significant art exhibition I ever went to. This is not a review of the exhibition and I just want to talk about three pictures that fired me up. I was attracted to the work by Ben Nicholson. 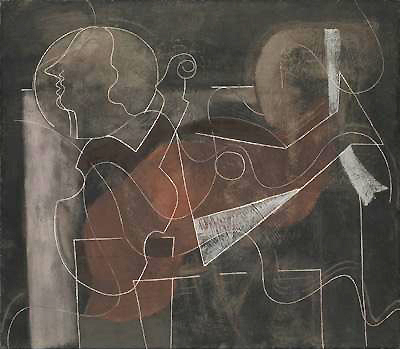 Ben Nicholson’s work in the early 1930s owes a debt to Picasso, but it was original. You can be influenced by other artists and be original at the same time. In fact, if you are not influenced by others, you are not original, you are illiterate. The exhibition has three paintings from this period: 1933 (Coin and musical instrument) (from the Metropolitan Museum of Art) (left), 1933 (Musical Instruments) (from Kettle’s Yard) and 1933 (St Remy, Provence) (from a private collection). As an artist, I am interested in the way these paintings were made. In 1933 (Coin and Musical instruments) a dark ground of browns and blacks has outlines scratched through to the white canvas and there are textures made by the use of a dry brush of one colour over another, none of this visible in the reproduction. Nicholson’s adaptations of Picasso’s style and methods were formal and his formalist trajectory took him to the white-on-white constructions of his later period, a long way from Picasso. 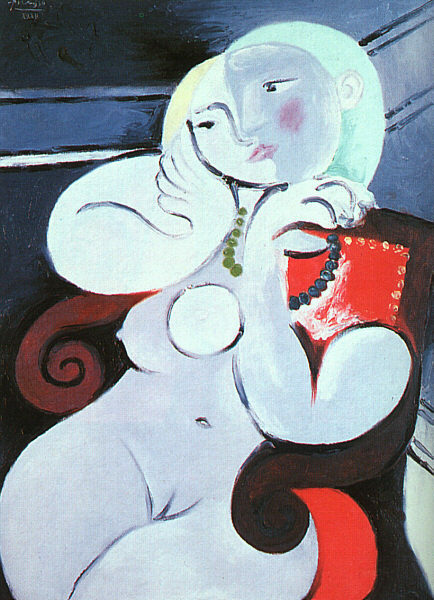 Finally, Picasso’s Portrait of Emilie Marguerite Walter (1939) (left). This is a deconstructed Picasso portrait of the type that generated so much mockery. Two things are now clear about such portraits. The first is that they are not arbitrary, as you will discover if you try to make such a portrait and arrange the features in an arbitrary way. David Hockney did some in homage, and there is a similar portrait of Christopher Isherwood, a good one, in this exhibition. 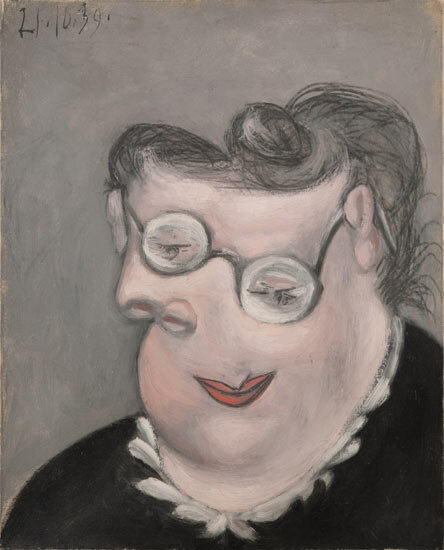 The second is that, although Picasso could make aggressive pictures like his weeping woman series, this picture of his lover’s mother is affectionate.